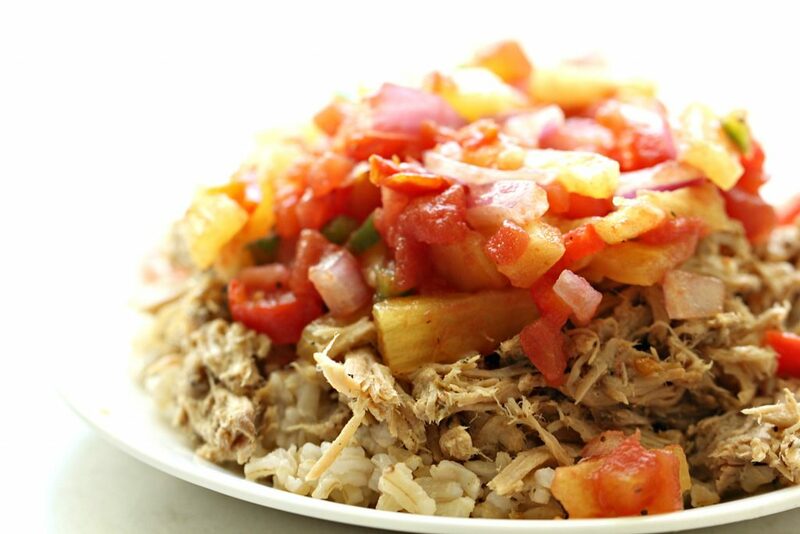 Sometimes I feel like slow cooker pork recipes all start to taste the same, so I decided to shake it up by adding a little bit of Caribbean flavor to this recipe! The key to this recipe is using a good Caribbean Jerk seasoning – this is the one that I used and I loved all the flavor that it added. After the pork slow cooked all day, I topped it off with a fresh salsa. 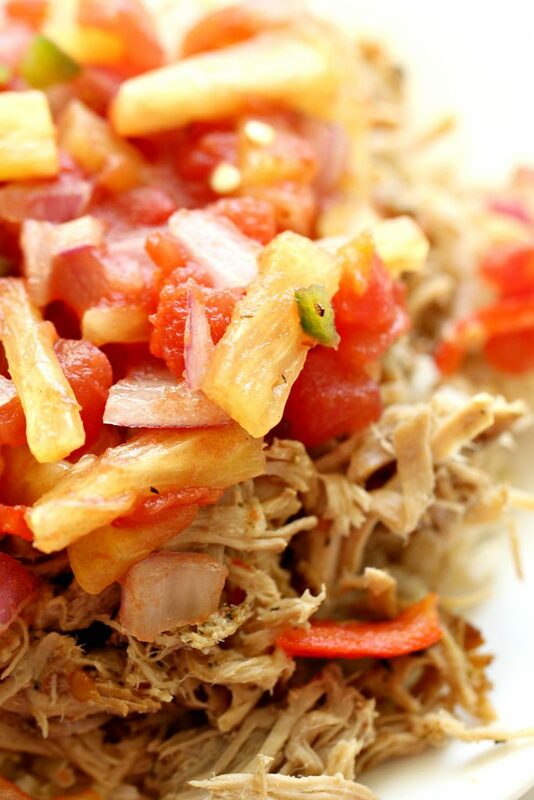 I love salsas that combine sweet and savory flavors and this salsa complimented the pork perfectly!! You could serve this over cooked rice or quinoa – either is delicious! In a small bowl, mix together crushed garlic, Caribbean Jerk seasoning, and salt. Rub mixture evenly on all sides of the roast. In a resealable gallon-sized bag, pour in the lime juice and orange juice. Mix together, then add the roast to the bag and seal tightly. Place the roast in the fridge for 5-8 hours (or overnight), turning occasionally so that the roast is evenly marinated. Spray slow cooker with non-stick cooking spray and pour all the contents from the bag into the slow cooker. Cook on low heat for 8-9 hours. Remove the roast and gently shred with two forks (the roast should easily fall apart). Remove liquid from slow cooker and set aside. Place the shredded pork back into the slow cooker and add 1 cup of the liquid back into the slow cooker; mix with the pork. Let pork cook for an additional 15-20 minutes on low heat. Mix together all salsa ingredients in a medium bowl. Cover and refrigerate at least 20-30 minutes to let flavors blend together. 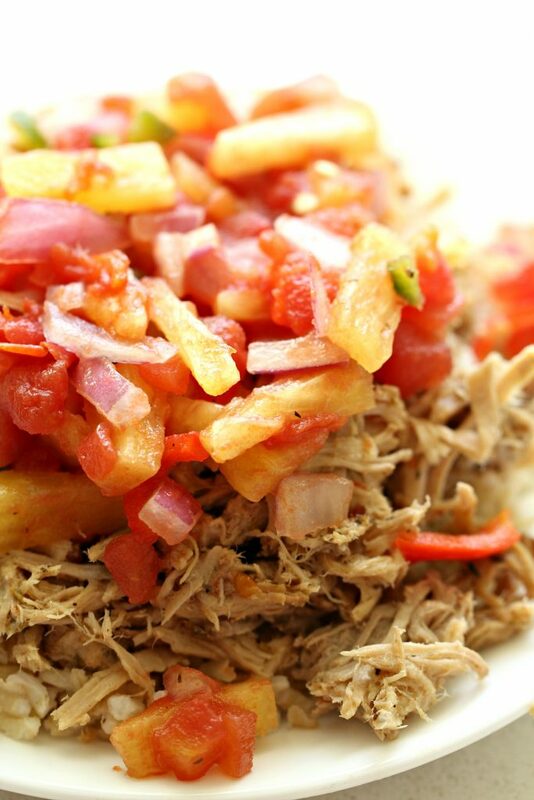 Serve pork topped with salsa.